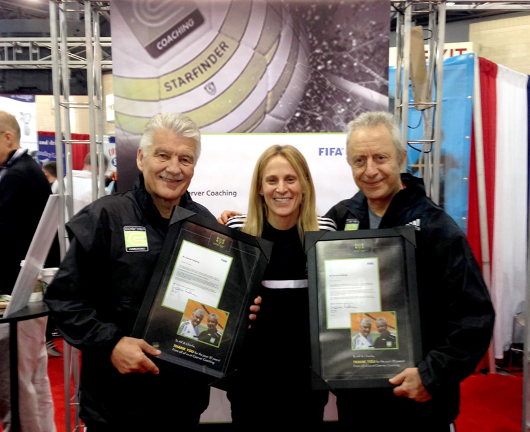 Two-time FIFA World Cup™ champion and two-time Olympic Gold medallist, Kristine Lilly, presented Coerver® Coaching Co-Founders Charlie Cooke and Alf Galustian with a letter from FIFA at the NSCAA Convention in Philadelphia last week. The letter is an acknowledgement of Coerver® Coaching’s 30 year contribution to the global development of the game. “FIFA recognises that it is the dedication and long term commitment of exceptional individuals to youth football development that is critical to the future health and vitality of the modern game. Alf Galustian and Charlie Cooke are two such exceptional individuals. As Co-Founders of the Coerver Coaching organization, Alf Galustian and Charlie Cooke have brought a gift of skilful football to hundreds of thousands of young people in over 40 countries, and helped thousands of coaches improve their teaching of the core technical skills that form the foundation of the game. Coerver® Coaching is very proud to celebrate its 30th year anniversary in 2014. 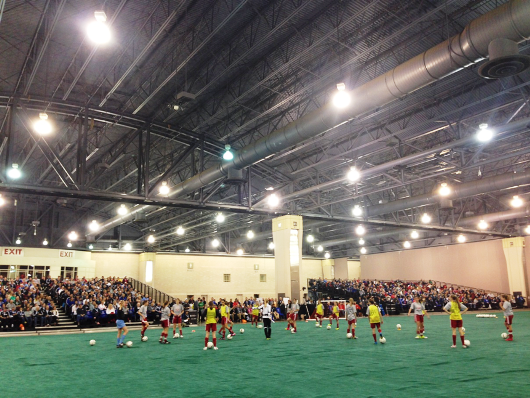 To kick off the anniversary, over 60 Coerver® Coaching Coaches from across America came together at the NSCAA convention. They were also joined by Shinji Ishibashi, President Coerver® Coaching Asia Pacific, Jason Lancsar, Vice President Coerver® Coaching Asia Pacific, Coerver® Japan Coach, Taki and Scott Wright, Coerver® Coaching UK Director. The event reinforced how Coerver® Coaching has become a truly global brand, now operating in 34 countries in 2014. A major highlight of the weekend was having two-time FIFA World Cup™ champion and two-time Olympic gold medallist, Kristine Lilly with the Coerver® team. 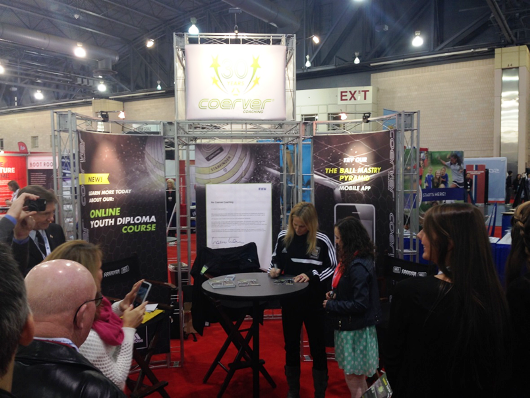 Kristine attended all of the Coerver® Coaching events, signing autographs at the exhibition booth and most importantly delivered an excellent Coerver® field session to hundreds of Coaches at the convention. Kristine is a legend in the game and still holds the record for most capped men’s or women’s soccer player in the history of the sport. Coerver® Coaching continues to work with Kristine to raise awareness and improve the Women’s game all over the globe. Coerver® Coaching co-founder Alfred Galustian said, “We are proud of many achievements at top clubs and Federations over the last 30 years, however we are particularly proud is that Coerver Coaching has changed the way Football is taught all round the World. I am also proud that we have provided so many grassroots players and coaches around the world, with a fun method of teaching that improves players, whatever level they may be”. Coerver® Coaching co-founder Charlie Cooke said, “We would like to thank all of our coaches, players, customers and parents for all of their support since 1984. We would also like to take this opportunity to thank our global partners, adidas, for their outstanding support for over 20 years”. Coerver® Coaching looks forward to many more fantastic events to celebrate its 30th anniversary. Check out our website and Follow @coervercoaching / @CoerverUK on Twitter for info on the latest Coerver® events and great coaching tips from our 30 years. This entry was posted in Coerver EMEA, Coerver News. Bookmark the permalink.